seasoning salt (I use Johnny’s from Costco, I hear Lawry’s is great too! Boil pasta. While pasta is cooking, season and cook chicken and onions in 1 tablespoon olive oil. (*Just a small tip: If you want to get your chicken pretty and browned, be patient. Don’t move the chicken constantly. Allow chicken to sit on medium temperature for long enough for it to get nice and brown, then stir and brown on other sides). Steam asparagus, salt and pepper to taste. Put asparagus in the bottom pan. Then layer chicken, then pasta. Drizzle 1/4 cup olive over everything. 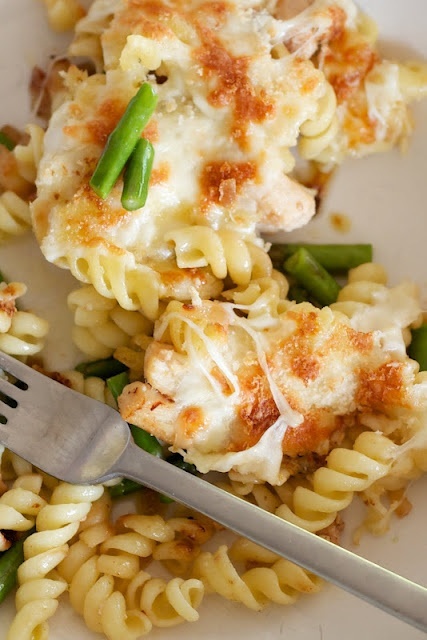 Lightly toss to coat chicken and asparagus. Top with cheese, then panko bread crumbs. Broil in the oven just until the cheese is melted and the breadcrumbs are nice and brown. Enjoy!